'COYOTES IN URBAN AREAS" - SPECIES SPOTLIGHT ARTICLE FROM TORONTO AND REGION CONSERVATION AUTHORITY'S WATERFRONT E-NEWSLETTER "SHORELINES"
The coyote (Canis latrans) are not a new species in Ontario, having migrated here over a century ago, however, their sightings in urban areas has been on the rise over the past few years. As urban sprawl has increased throughout the years and humans begin to impede on natural habitats, coyotes have learned to adapt very well to life in the city. Do not let pets chase a coyote or roam at large. Always keep dogs on a leash. Ontario is home to over 30,000 plant & animal species. 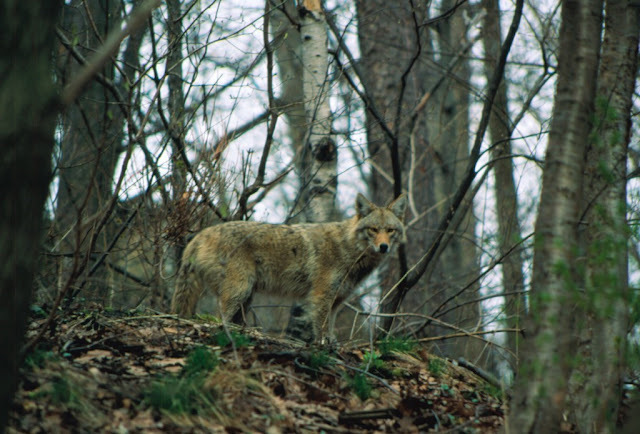 Coyotes are just one of those species that contribute to Ontario’s healthy ecosystem. The key to humans and coyotes co-existing lies in us understanding the species and learning to share the natural world with them. 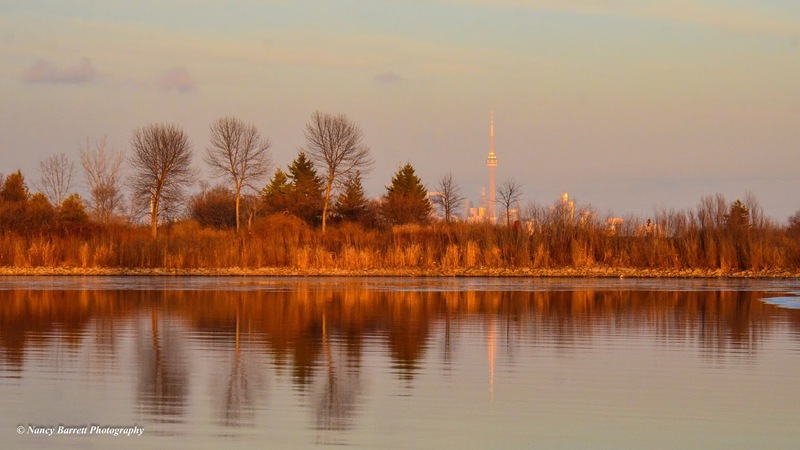 APRIL 4TH - IRENE CHOLEWKA'S PHOTO EXHIBIT - "LIFE - IN COLONEL SAMUEL SMITH PARK"
Join us on Wednesday, April 4 between 6-8 pm for the launch of "LIFE – in Colonel Samuel Smith Park", an original photography exhibition by local artist, Irene Cholewka. This alluring collection is a unique compilation of photographs that showcases the diverse wildlife and beauty in our neighbourhood park. Free event. Everyone welcome. Light refreshments will be available. 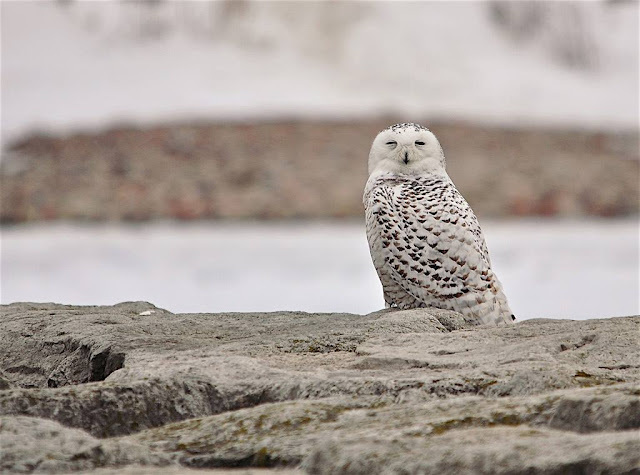 rare or unusual species that become a magnet for birders and photographers. I have found through years of exploring Colonel Samuel Smith Park and Humber Bay Park that some of the best views of sea and diving ducks can be had on sunny, calm winter days, in sheltered bays and inlets where there are open areas of water in the lake ice. Ice shelves seem particularly attractive, and many species, some of which are rarely seen close to shore, will congregate to feed. Dabbling ducks and coots, looking for aquatic plants in shallow areas or along the shore, often accompany them. 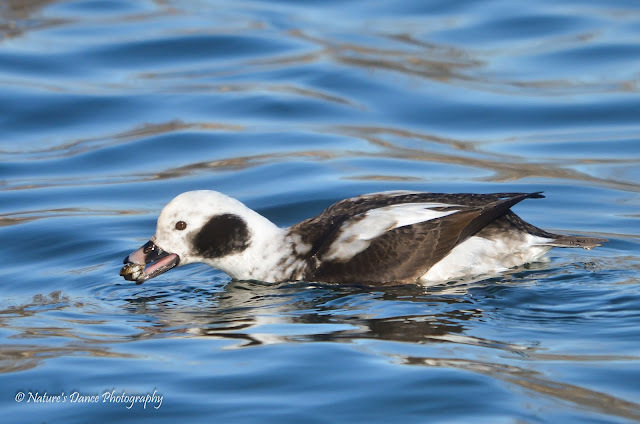 Long-tailed Ducks gather in large rafts (swimming groups) offshore, always accompanied by their distinctive calls. 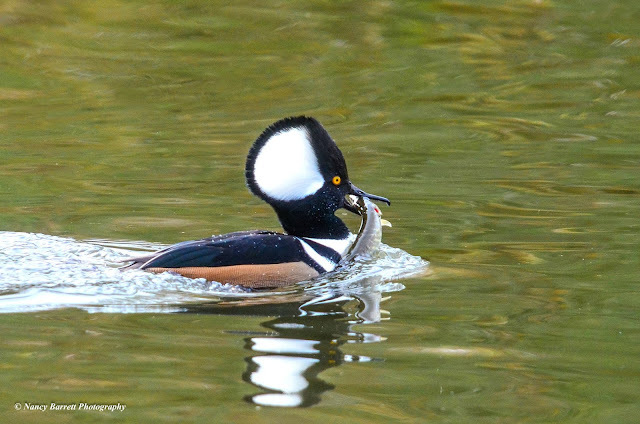 Red-breasted Merganser (males). 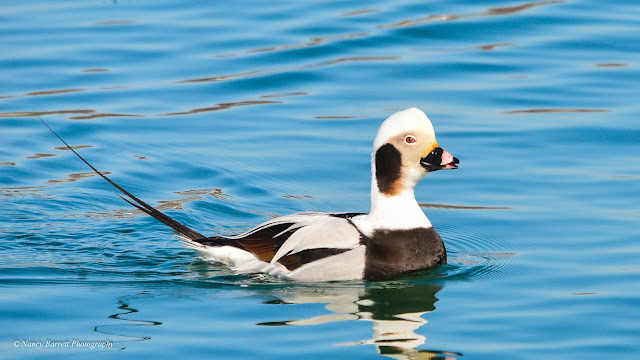 Specializing in fish and crustaceans, these diving ducks have serrated bills for efficient hunting. 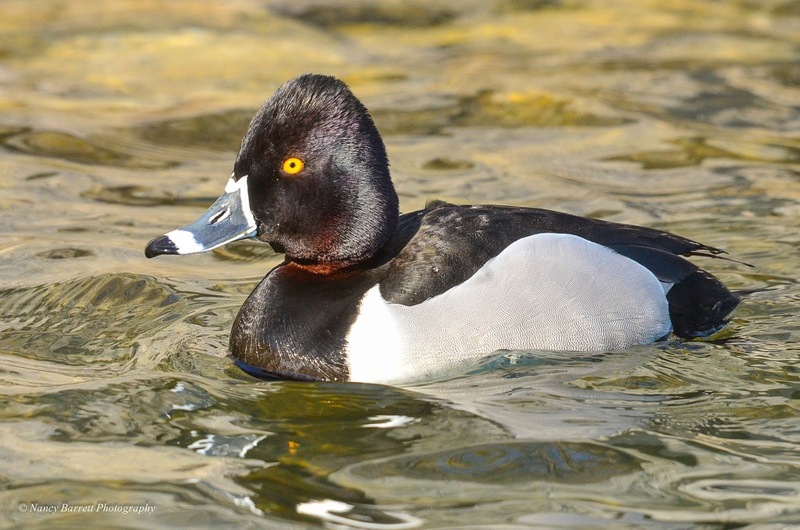 Ring-necked Ducks seem misnamed, given that their cinnamon collars can only be seen in good light. They are seen occasionally in small groups or pairs in winter. 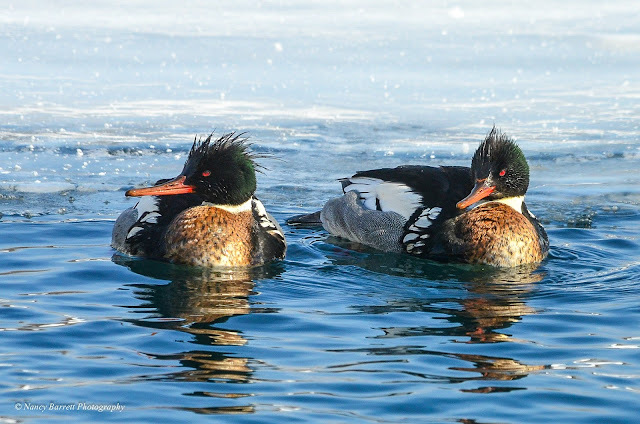 While many female duck species tend to wear more subtle, cryptic plumage year-round, male ducks--called drakes--are in their finest breeding (or alternate) plumage through the late fall and winter, best seen in the early morning or late afternoon sunshine. 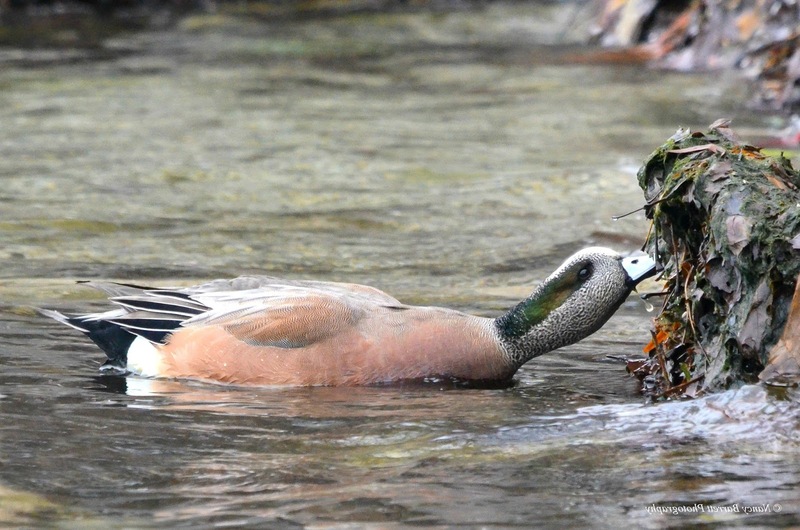 The feathers of some drakes can light up with multicoloured iridescence that looks dull or black under overcast skies. The ubiquitous Mallard gets short shrift much of the time, but it is undeniably attractive (they think so too). 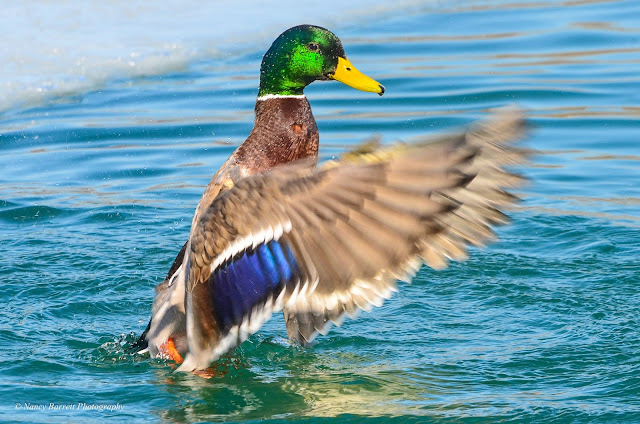 Mallard drake, showing off that iridescent blue speculum. 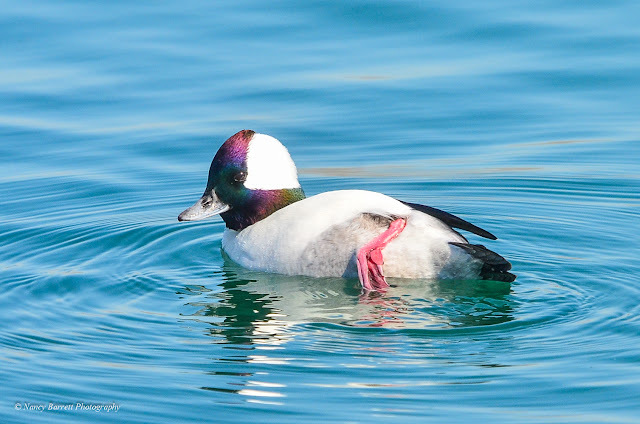 Bufflehead drakes shine in the right light, the better to attract receptive females. Feeding behaviour of the different species is also easily observed under these ideal conditions. In what seems like a lucky stroke, some diving ducks have developed a taste for invasive zebra mussels, along with their usual clams and crustaceans. However, further research is needed to determine the accumulative effects of contaminant burdens from the zebra mussels. Greater and Lesser Scaups, Long-tailed Ducks, and Scoters are among those that manage to swallow the clams whole, where the hard shells are later crushed in the gizzard. 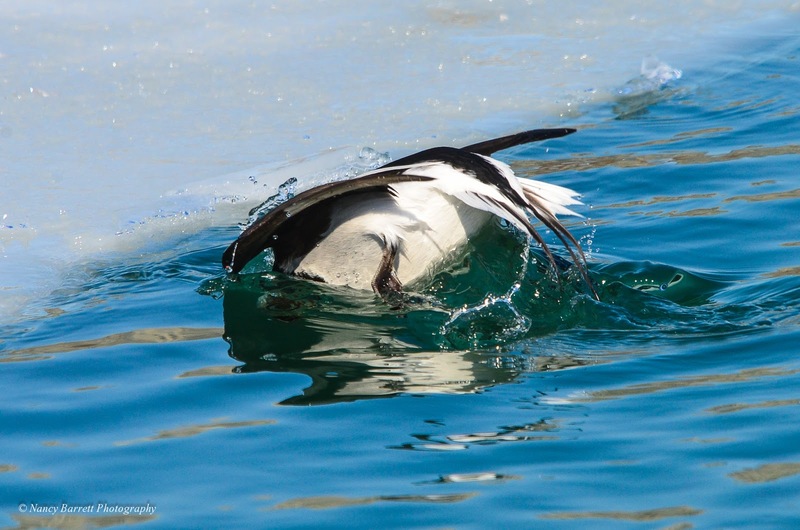 Long-tailed Duck diving for mussels under ice shelf. Female Long-tailed Duck with zebra mussels. 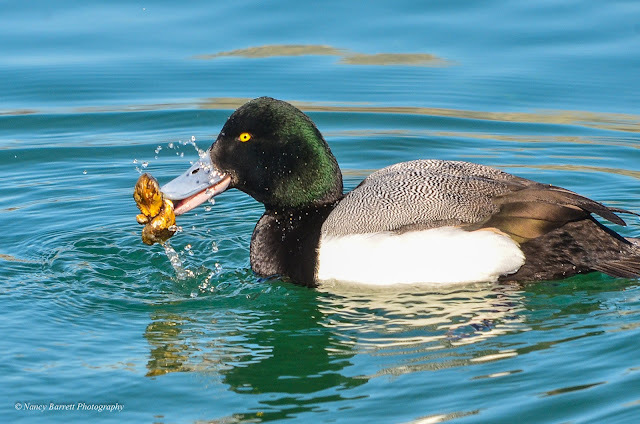 Greater Scaup drake with a mouthful of fresh clams. American Wigeon eating algae from rock face. A Hooded Merganser grasps its fishy meal with a serrated bill. 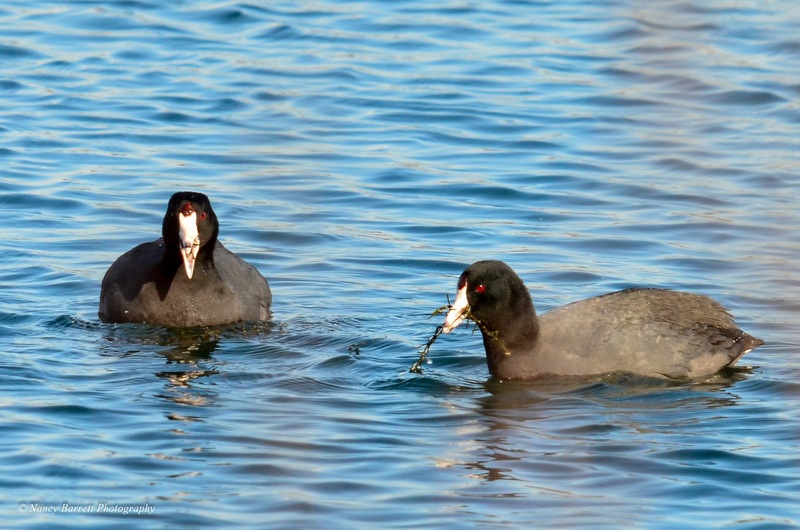 American Coots are a good reminder that not everything that floats is a duck! 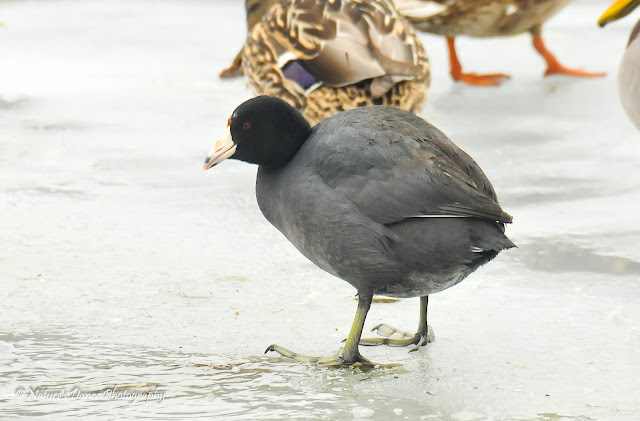 Coots are related to the rails; they have large feet with lobed toes, rather than webbed toes like ducks, and rather than waddling on land, they have a still-comical chicken-like gait. 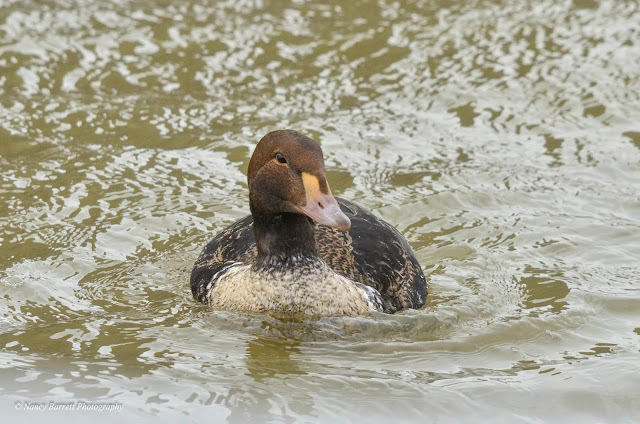 They can be seen in small numbers, mingling with other dabblers, feeding on aquatic plants. American Coots with aquatic plants. The uniquely lobed toes of a coot. 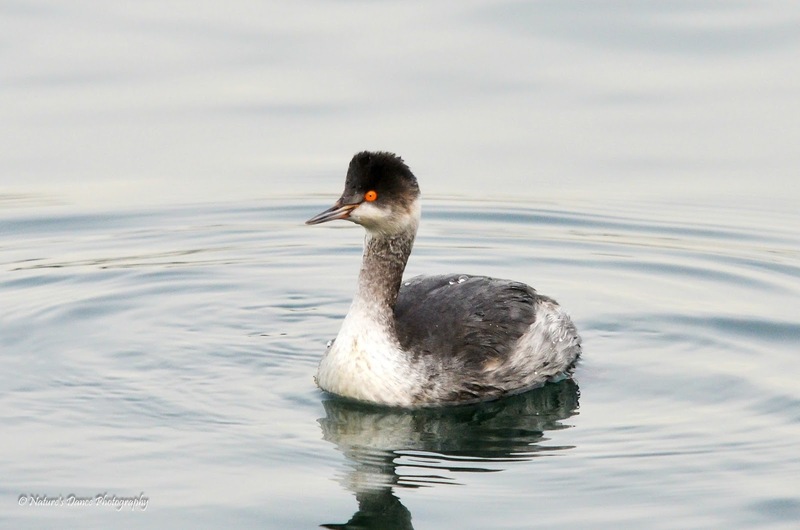 Grebes, another type of waterfowl seen in winter, share lobed toes with the coots, but they have no close avian relatives. With legs situated far to the rear of their bodies, these birds are barely able to walk on land. 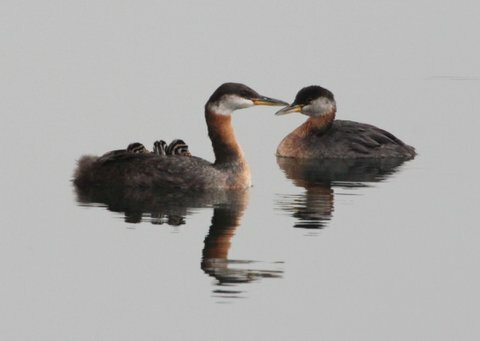 Red-necked Grebes, which nest in Col. Sam Smith Park and Humber Bay Park East, often linger into November and begin returning in late February. The pairs return to their usual territories--nests of sticks and vegetation built on floating wooden platforms provided by supporters to encourage breeding--already singing their raucous songs of love and challenge. Red-necked Grebe in winter (or basic) plumage, November. 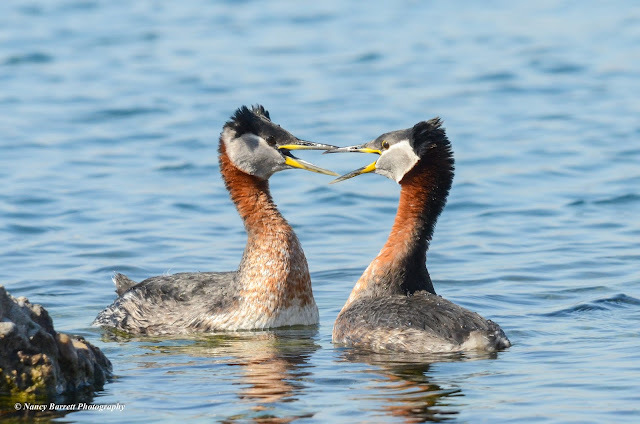 Red-necked Grebe pair in courtship, March. Taking over from the Red-necked Grebes once they leave, Horned Grebes are seen mainly in migration or while over-wintering on the great lakes; they breed across western Canada and the Yukon. Horned Grebe with stickleback, December. 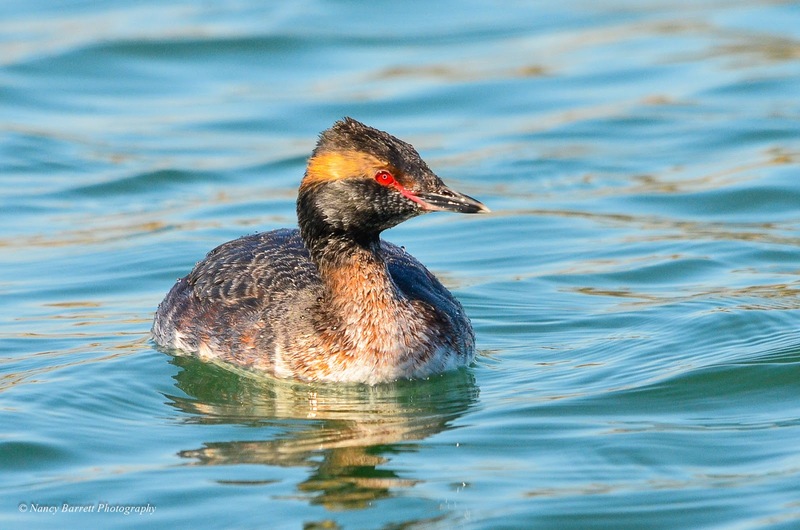 Horned Grebe moulting into breeding plumage, late March. Petite Pied-billed Grebes can be found in the open water of harbours and bays in the winter. 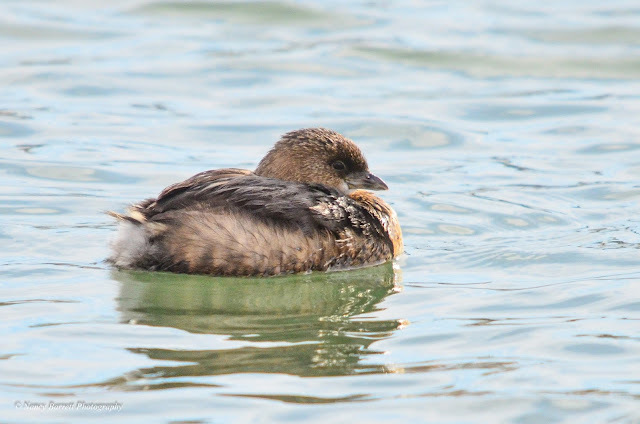 Pied-billed Grebe in non-breeding (basic) plumage, Humber Bay Park, late January. 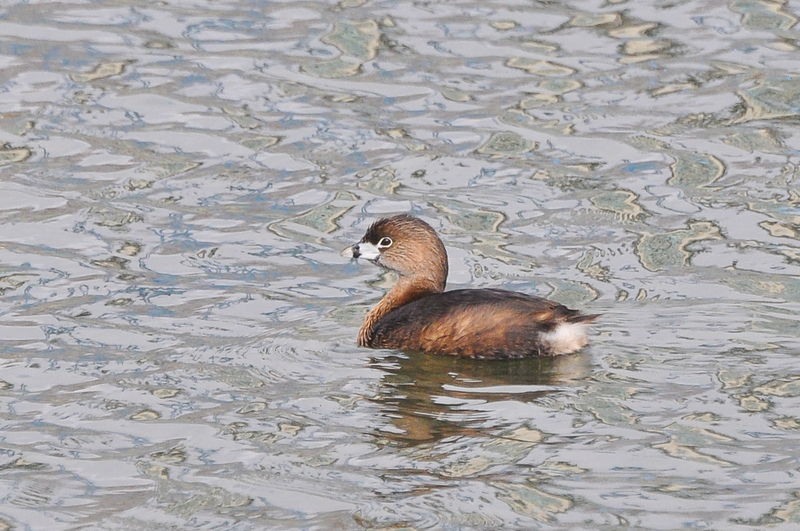 This Pied-billed Grebe is almost in breeding (alternate) plumage, Col. Sam Smith Park, late February. 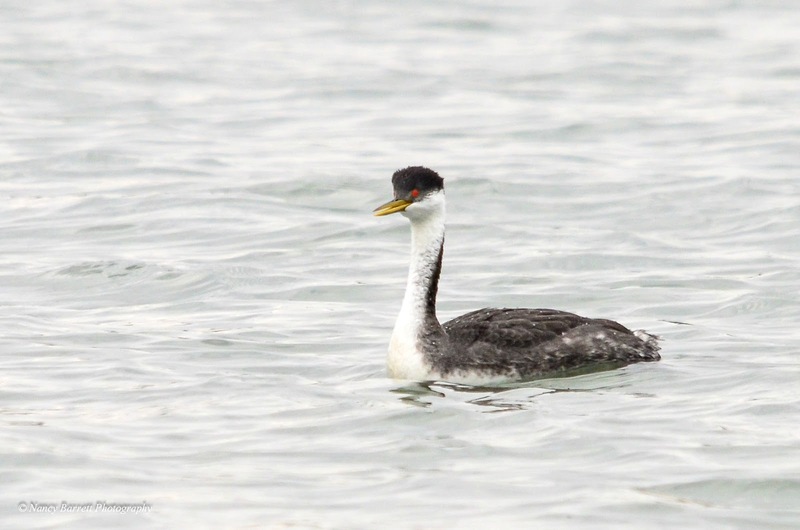 Seen in winter in Toronto only rarely is the Eared Grebe. This beauty stayed for a while in January, 2017, Col. Sam Smith Park. Canada Geese now overwinter along the lake shore parks in great numbers, similar to Mallards, no doubt aided by overfeeding and the proliferation of grassy lawns. They tend to be somewhat overlooked, but when a large flock is stretched out in a long "V" across the sky and bugling loudly, they are hard to ignore. 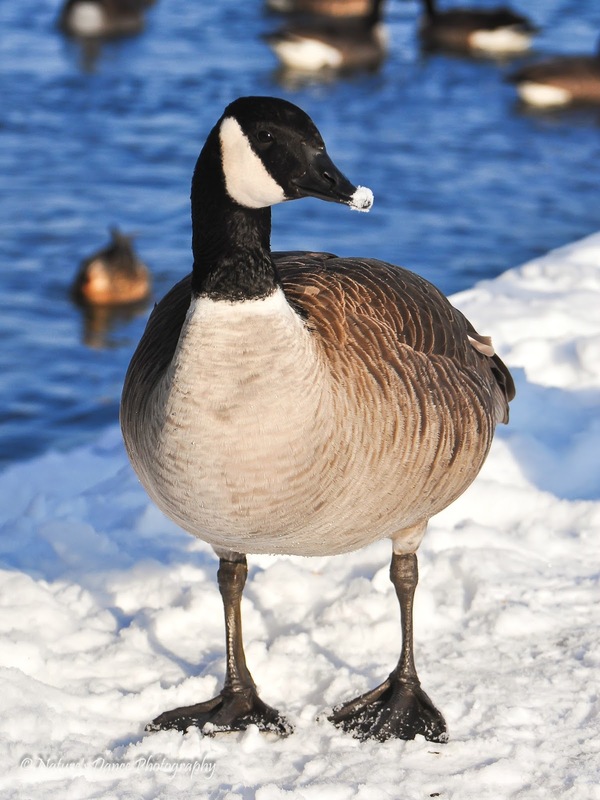 There are several subspecies of Canada Geese ranging across Canada, with the smallest now recognized as a different species - The Cackling Goose. 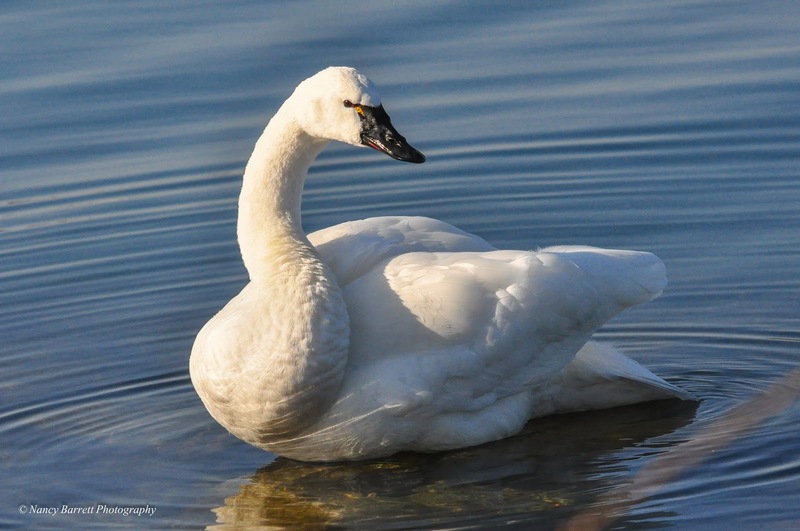 All three of our swan species can be seen along the lakeshore in winter, or flying overhead in small flocks. 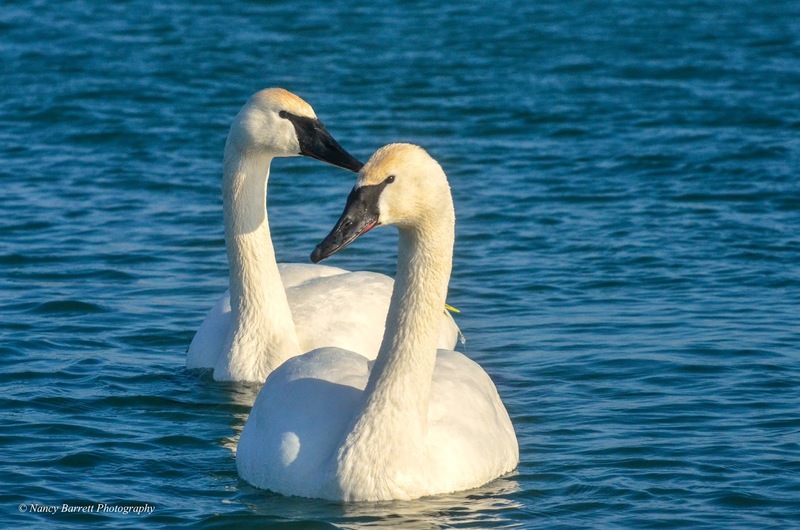 Although native Trumpeter Swans, once extirpated from Ontario but now successfully reintroduced through captive breeding programs, are more common west and east of the west Toronto lake shore, they can be seen passing overhead or stopping for a rest and a meal. 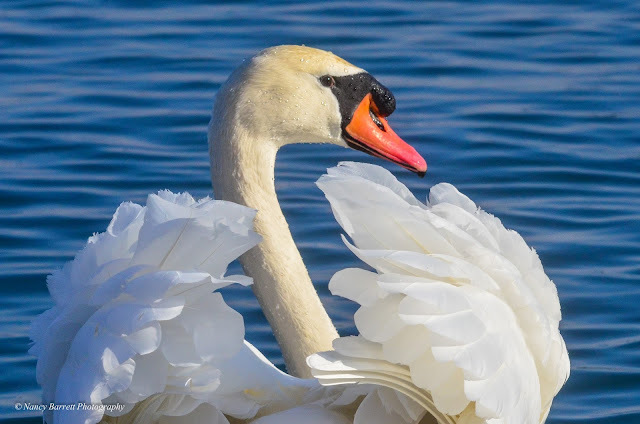 Introduced from Europe, Mute Swans directly compete for the traditional nesting habitat of the Trumpeters. Trumpeter Swans are easily identified by their all-black faces, yellow wing tags and leg bands; they are carefully monitored. Our other native swan species, the Tundra Swan, begins to migrate back toward the Arctic tundra in February-March, "staging" in large numbers around the northern Lake Erie bays, marshes and fields, and are occasionally spotted here in our parks. Tundra Swans usually show a yellow spot on the facial skin and hold their necks straight (not apparent in this preening bird from Col. Sam Smith Park, March 2012. Introduced Mute Swans have bright-orange bills and carry their necks in an elegant S-shape. This cob is already displaying in January. 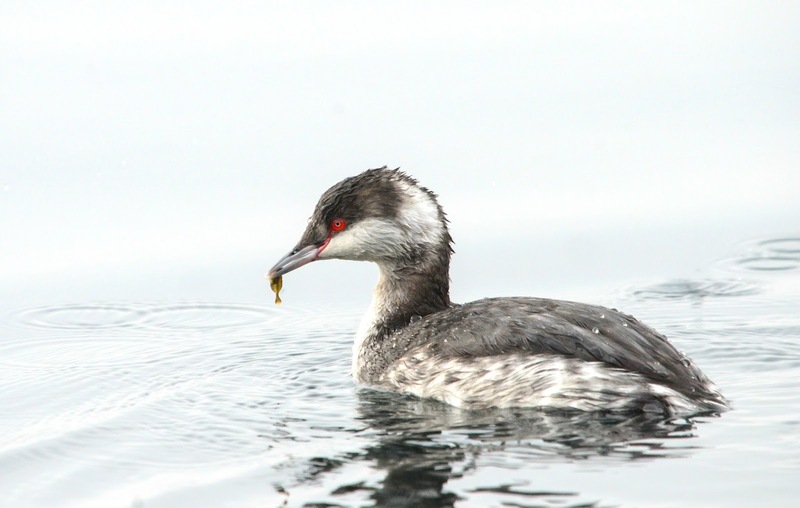 We, the cold, are occasionally rewarded with rare or unusual species in winter, like the aforementioned Eared Grebe. King Eiders, usually immatures, tend to show up in ones and twos every winter. 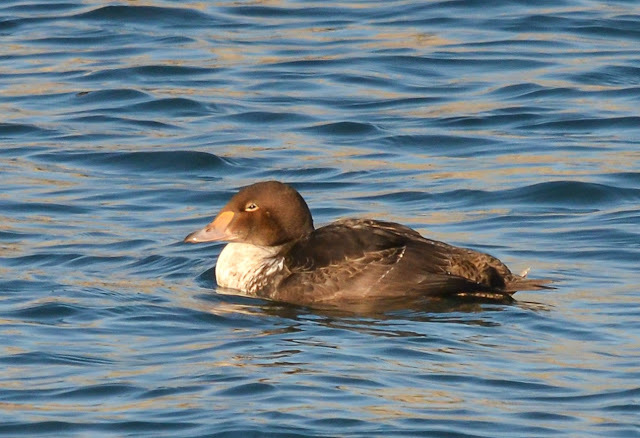 Immature male King Eider, mouth of Humber River, November 2014. Immature male King Eider, Col. Sam Smith Park, January 2017. This one stayed around long enough to start moulting into more adult plumage. Another rarity that tends to show up annually in winter is the Harlequin Duck, a bird of fast-moving water breeding on fast-flowing streams in northern Quebec and Labrador. Some end up wintering on the great lakes and the Niagara River in low numbers. 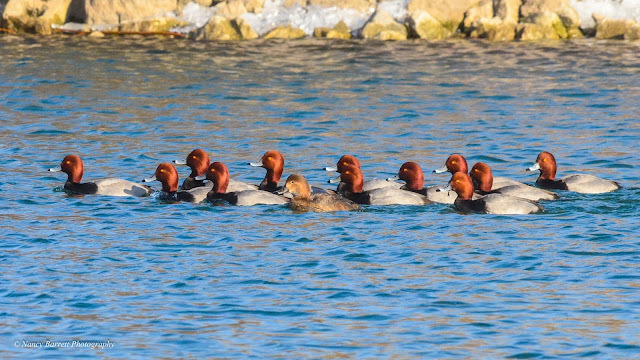 An immature male Harlequin hanging out with his Redhead pals, 2016. 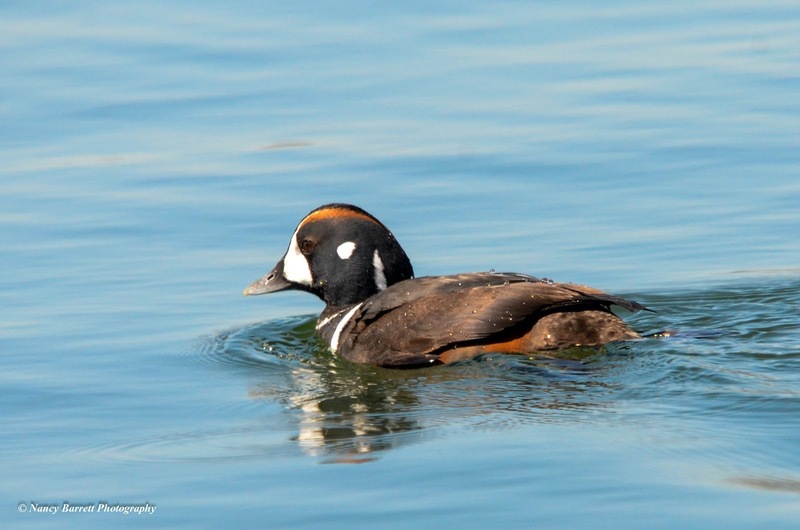 Immature male Harlequin Duck, 2016. Much less commonly reported, but a species that seems to have had an affinity for the west Toronto shores in the past, is the Western Grebe. Strictly a western bird, it does rarely wander far off course--to thrill many admirers. 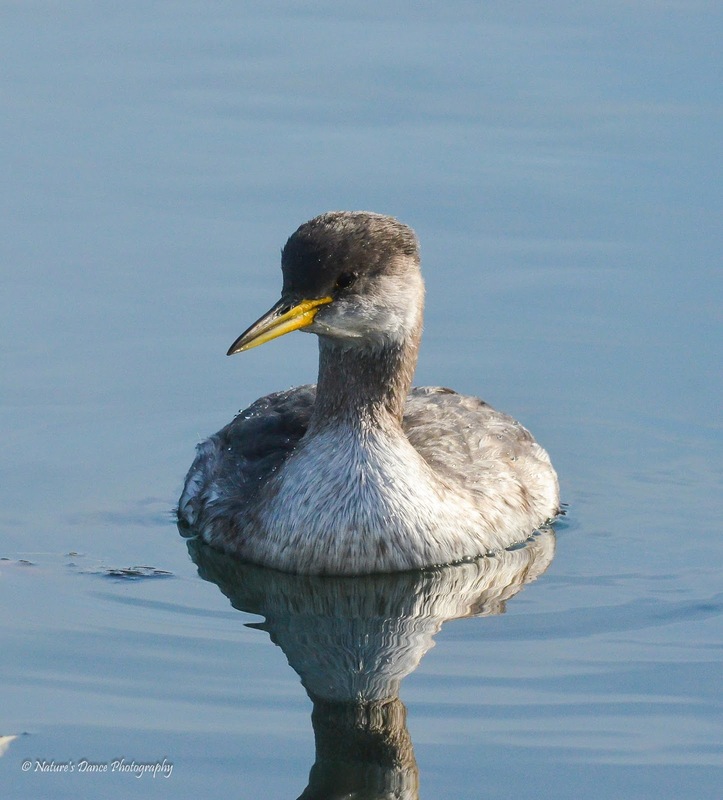 Western Grebe, Col. Sam Smith Park, 2013. Although they are much more expected annually than the rarities above, some of the following species are always nice to see on a winter's outing along the lake. 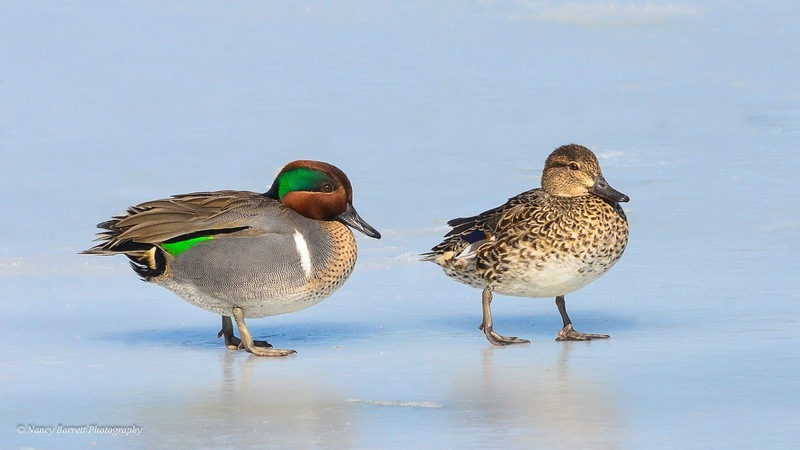 This pair of Green-winged Teal was a very pleasant surprise as they loafed on the ice at Humber Bay in March 2014. 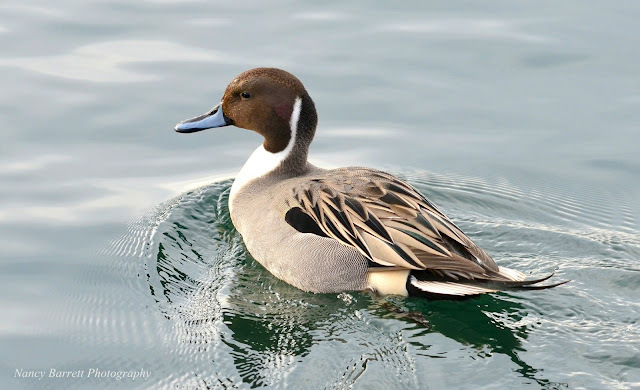 This handsome Northern Pintail stayed for a long time in the fall/winter of 2012/13, at Humber Bay Park East. 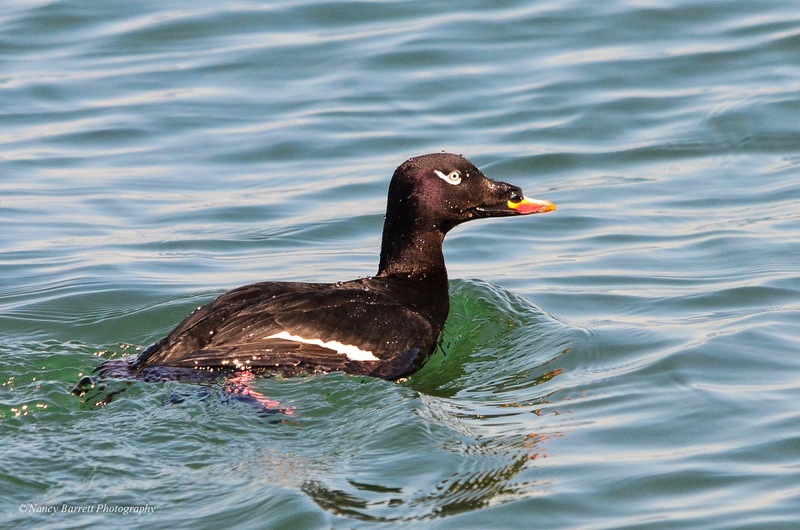 This bizarre sea duck, an adult male White-winged Scoter of the coastal waters, breeds farther inland than the other two scoter species and is the one most likely to appear on the great lakes during migration. 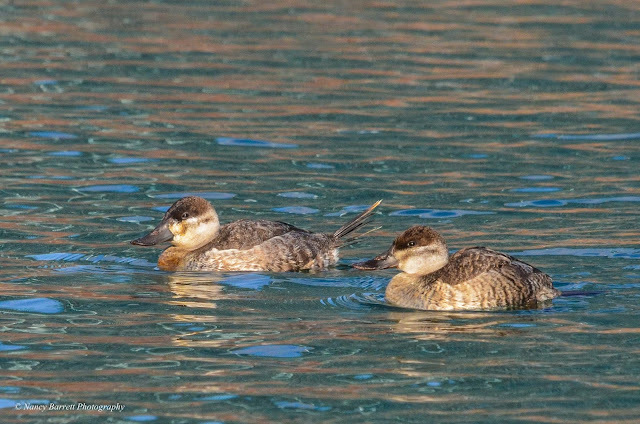 A mated pair stayed for a while at the stormwater pond at Humber Bay Park in 2014. 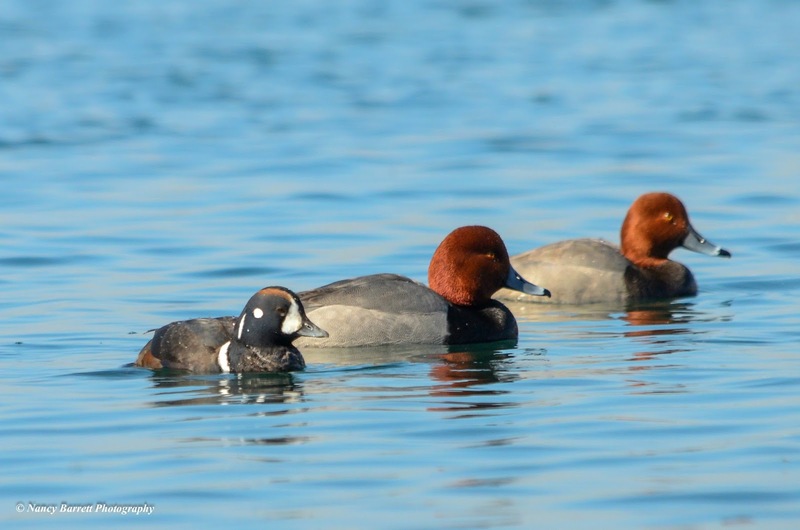 Ruddy Ducks are sometimes seen loafing far out on the bay at Humber Bay Park East. 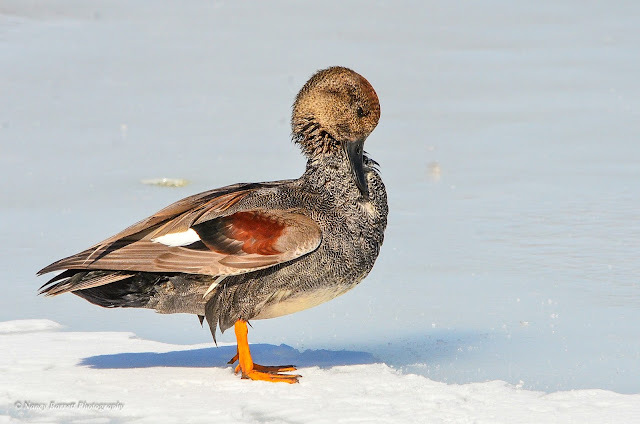 Strangely, these tiny ducks adopt breeding plumage opposite most other species, wearing muted colours in winter. A characteristic field mark is the tail held upright. 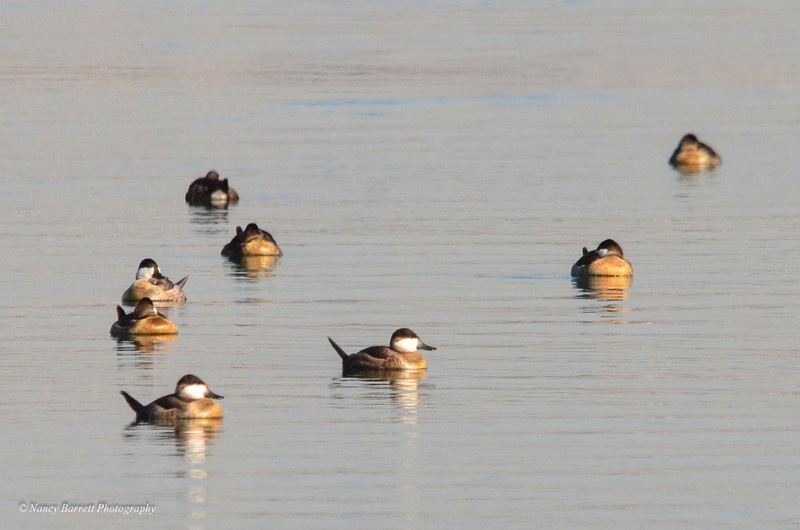 Ruddy Ducks in December. 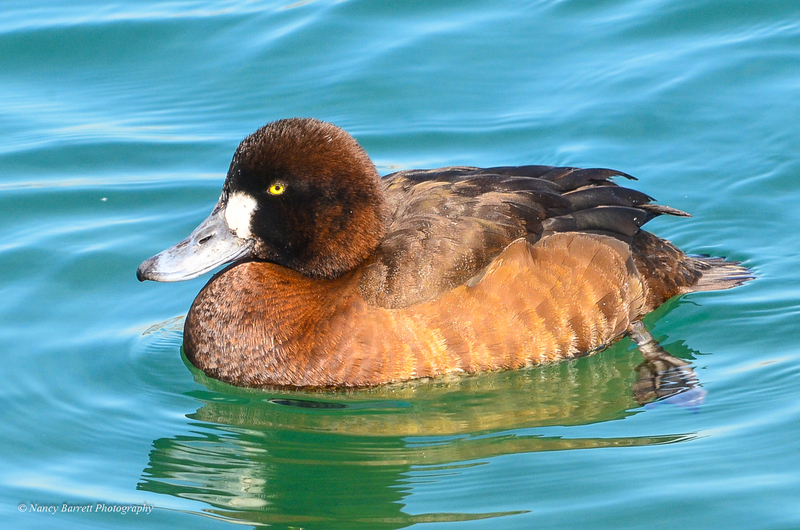 Adult males have the bright white cheek patch. Immature male (L) and immature female Ruddy Ducks in January. I have a friend or two who think that ducks and other waterfowl are (yaawwwn) boring. True enough, when peering at distant rafts of indistinguishable ducks out on the lake on a cold, grey day, then maybe they can be boring. But, every once in a while, conditions are just right for an up-close and personal--and very unboring-- look at some very brightly coloured birds in an otherwise stark winter landscape. Bird walks are arranged several times a year at Col. Sam Smith Park, advertised on the Friends of Sam Smith Park site. Recommended field guide: Sibley Birds East. COLONEL SAM SMITH ANNUAL CLEAN-UP DAY: SUNDAY, APRIL 15. Alan Roy, Organizer. SPRING BIRD FESTIVAL: MAY 26, 2018. Check the blog for details. Sponsors and volunteers enthusiastically requested. BY-LAW OFFICER INFORMATION SESSION: FOSS thanks by-law officer Gary Borges for his most informative session regarding the enforcement of by-laws in Toronto parks. At any given time, there are only 10 enforcement officers available to respond to calls in Toronto’s approximately 1700 parks. Beginning May 24 (tentatively), officer hours will be extended to 3:00AM; otherwise, they are on-call between 7:00AM and 3:00PM, Saturday-Wednesday. Calls/e-mails to 311 (attach photos whenever possible) are needed for the city to respond to complaints and to justify enforcement blitzes. Off-leash dog reports are the #1 complaint ($360 fine). Commercial dog walkers (as well as the dogs in their care) must be licensed. Dog walkers must also have $2 million liability insurance. The maximum number of dogs allowed per walker is 6. Any organized sport/activity must be licensed. There is a $360 fine for fishing in a prohibited (i.e. unsigned) area. 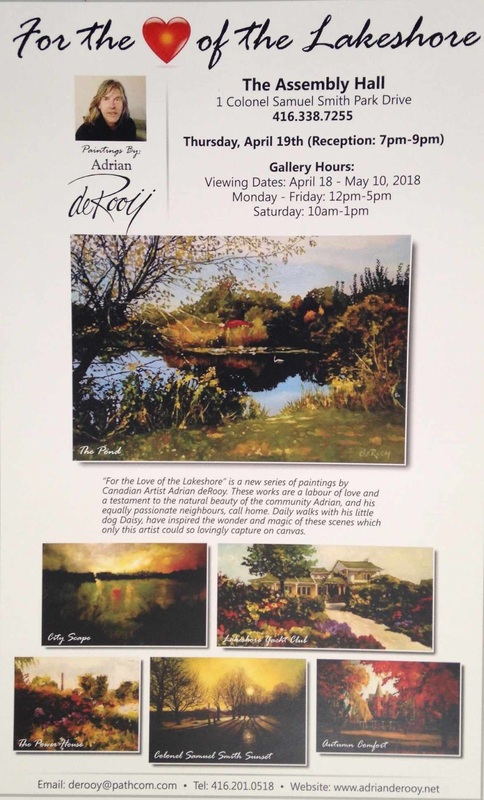 2018 FOSS PHOTO EXHIBIT: Opening reception: October 11. Photos will be displayed through November 9. Check the blog for updates. FOSS WINTER BIRD FEEDER PROJECT: 7 individuals, with additional help from the Lakeshore Scouts, enthusiastically maintain 6 seed and 6 suet feeders alongside the Col. Sam skating path. FOSS thanks the Urban Nature Store for its generous support. Thanks also to park supporter Bruce Wilkinson for his devotion to the park and its birds. POND LOOKOUT PLATFORM GRATE PROBLEMS: FOSS has been informed that wheel chairs have become stuck in the decking grates--posing a safety hazard. FOSS has informed city authorities about this problem. A city representative plans to meet with a wheel chair user to obtain feedback that will lead to a solution to the problem. SALT ON PARK PATHS: FOSS is concerned about the excessive amount of salt that has been spread to keep cycling paths open. High accumulations of salt are a danger to both the lake (the source of Toronto’s drinking water) and the nearby wetlands. FOSS has contacted park management about this matter. No reply as yet received. FOSS SOCIAL MEDIA ACCOUNTS: Check out FOSS on Instagram, Facebook and Twitter. No personal Facebook account? You may still view the contents, but you will be unable to post comments. ASSEMBLY HALL CULTURAL DAYS, FALL 2018: FOSS volunteers will lead nature photography sessions in Colonel Sam Park and facilitate children’s bird feeder and bird nesting material projects. Check the blog for updates.